It's hard to imagine an easier way to cook steak than in a cast iron skillet. Fortunately, it's also one of the tastiest ways to cook a steak. 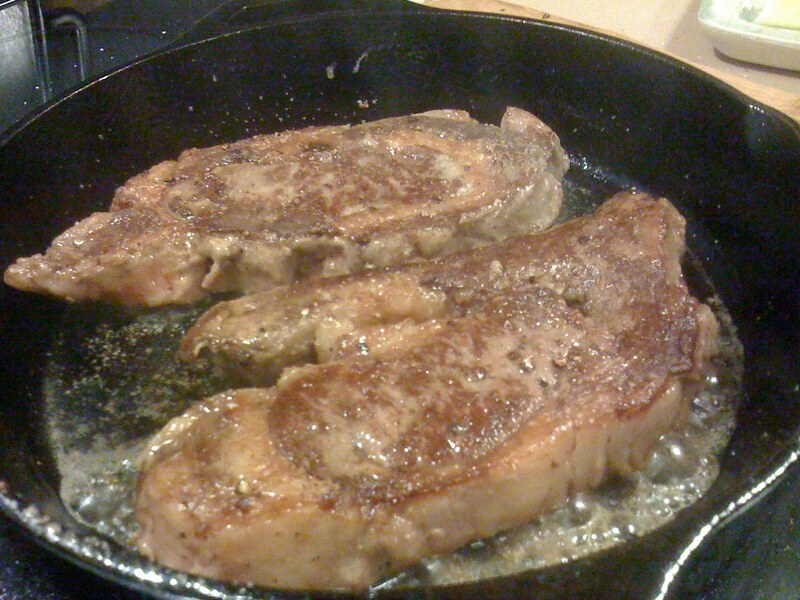 The hot cast iron results in a nice browning on the steak, searing in whatever seasoning you may have applied. I'm a bit of a purist with steak, and stick to just salt and pepper. You do whatever you like. Salt and pepper your steaks generously. Heat a medium cast iron skillet on medium-high heat until just smoking. Add a drizzle of oil, and then a fat pat of butter, and slap the steaks down to cook. Once they've browned a bit (after maybe 4 minutes? ), flip 'em over. Continue flipping every 3-4 minutes until done. You may need to adjust the heat downward as you go if you're cooking to medium or beyond. Because I like my steaks cooked to a perfect rare, I used an instant-read meat thermometer. If you're winging it or basing it on cooking time... be sure to account for steak thickness, stove temperature variance, and planetary alignment. Remember: You can always put an under-cooked steak back on the heat. Pretty tough to un-cook a steak. I like my steaks medium and medium well at times. I'm an avid grill master, and there was once a time I would have laughed at the idea of not cooking a steak over flame and coals(no gas, as gas grills are for chumps). That all changed when I got my cast iron skillet. My method is slightly different from yours. I rub olive oil on my steak , then liberally rub kosher salt and cracked pepper into them. Sometimes I add a little garlic and white pepper as well(I also, at times, throw on the entire spice rack for a little fun). After that, I let them rest for a half hour or so. Since I don't like mine rare, and my kid likes them turned into leather, I heat my oven to 350. I heat the skillet on medium, just as you do. When the skillet is ready, I plop the steaks on and brown one side. When it's time to flip, obviously, I flip them. I then put them in the oven to continue the process. It doesn't take long. Maybe five minutes for medium and medium well. While in the oven, the other side browns nicely. After I pull them out, I let them rest and place the skillet back over medium heat. There's too many goodies left behind to not use them for something. I like to add a little red wine to deglaze the skillet by lightly scraping the spicy goodies and when the wine starts to reduce, I add beef broth or consume. Once it all comes to a slight boil, I pour into a small sauce bowl and use it as a dipping sauce. It can also be poured over the steaks as well. It's amazing how juicy and delicious the steaks are when using this method. Even a well done steak is juicy. It's almost a no fail method. The bonus, is the dipping sauce. You don't even need it, but wow, it's some tasty stuff. It's like crack. Everyone who's tried it, thinks I slaved away to make it, and have no clue how easy the entire process is. It's one of the greatest cooking discoveries I ever made. It's all thanks to my cast iron skillet. No kitchen should be without one. Cast iron is the bomb. Even my smoker grill grates are cast iron. Anything else is just a waist of time. Thanks for stopping by and for sharing your method. I'll give that a try! One of the best things about cast iron is that while it's nonstick you can still develop enough "goodies" in the pan to make a nice pan sauce. I've used this recipe twice now and it's always turned out awesome. Thanks, dude. A cast iron skillet is on my shopping list!! Steak on any grill is hard to beat... But glad to hear that a cast iron skillet is on your shopping list. Swing back by once you have that skillet and let us know how it's going! As I wrote in my comment on your page here about cast iron maintenance, I've got a griddle and a skillet. I've grilled tons of dead cow on my griddle - and it NEVER fails. You have a skillet too, Derek: tell me what you think of my method. 1. Have your steaks reach room temperature. Season w/ salt, and if desired, pepper. 2. Pre-heat the oven... the temperature can be anywhere from the mid-400s to 525 (my oven's maximum). Have the griddle on the 2nd "level" (not immediately under the flame, but on the 2nd highest height). 20-30 minutes. 3. Open the stove, and place each steak on the griddle. I usually spray a little Pam on the griddle, but to make sure no accidents happen, I pull the griddle out and rest it on the opened stove door. 4. Place the griddle back. For steaks 1/2 inch thick, 2 minutes; open the steak, flip each steak, 2 more minutes. Turn off the stove, take the steaks out, let sit for a minute or two, and serve. For thicker cuts - 1" and even thicker - 4 minutes each side for medium rare, 5-6 minutes for medium. 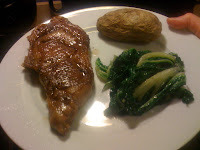 I have recently begun to brush a bit of olive oil on the steaks for extra flavor. Your recipe sounds perfect. Seriously. For food safety reasons, I typically warm my beef (or bison) in a warm water bath--inside a Ziploc bag. That way it goes from fridge temp to room temp in about 20 minutes. I also typically rely on touch and/or an instant-read meat thermometer to judge doneness. Oven temps, steak thickness, and beginning meat temperatures can fluctuate so much. But if you have a way to control those things, time can work beautifully. My cast iron's are about 80 yes old they have Ben passed down in my family. They have never Ben washed! They are seasoned perfect! Steaks always turn out awesome! Those sound like some nice pans! Thanks for stopping by!